I finished the rhubarb shawl last night. I accidentally grafted the halves together upside down and debated taking it apart and redoing it. Then I saw how rustic and interesting the seam looked, sort of like a twig among the scattered pink foliage, and I decided to leave it alone. 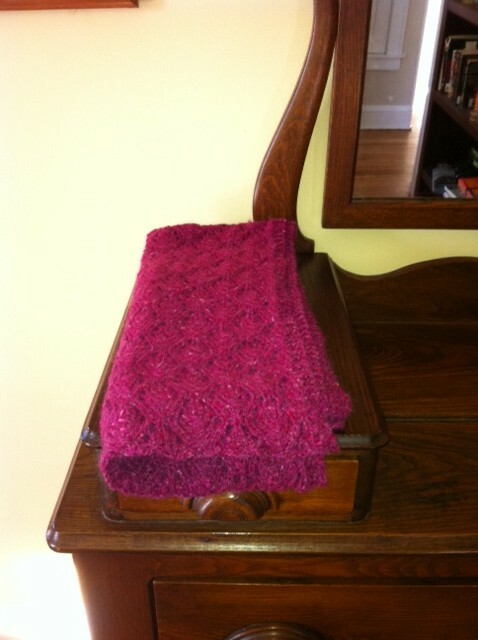 The shawl, demurely displayed on my dresser, all inviting and warm looking. It’s not a mistake. It’s a reflection of my personal style. 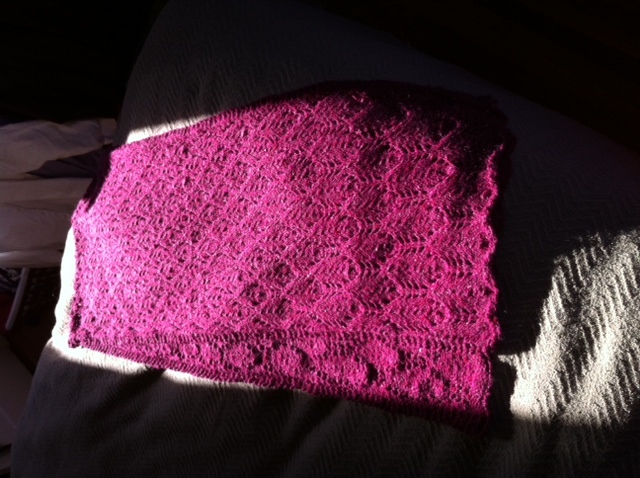 The finished shawl, glowing in the morning sun. The guest room is the only room in my house suitable for blocking knitting projects. It has a bed we don’t use, suitable for spreading out my blocking boards. And it has a door that closes: important for keeping the cats at bay. Practically the first thing our long-hair did, when he discovered me up there, pinning away, was to jump onto the bed and run along the length of the shawl to get to the window. And he’s not the problem child. The little one still hasn’t figured out how to put away his claws when he’s not using them. So yeah, I locked that room down after that. I stuffed the shawl into a padded mailer this morning, after ascertaining that it was dry, and sent it on its way to Wisconsin. I hope my friend will like it. If your friend doesn’t like it I promise to give it a good home! It’s lovely. Caitlin, It is gorgeous. Well done!